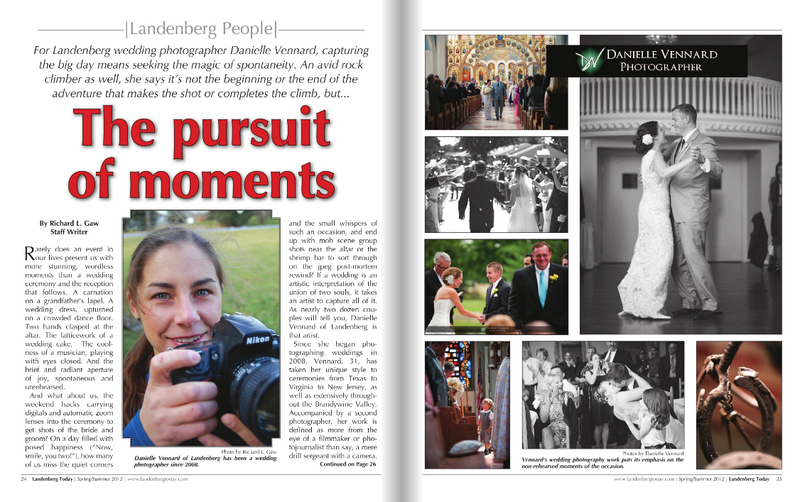 A local printed publication in Chester County, PA, titled, Landenberg Today, just published an article in the Spring/Summer 2012 issue called The Pursuit of Moments. The journalist, Richard Gaw, interviewed me a good while back intending to spotlight my photography business but instead came away with much more than just a business write up. He did a fantastic job in telling a short version of my life story in a very eloquently written piece. Thank you to two of my brides, Christina and Paige for giving such wonderful quotes to add to the piece. Also thank you to my mentor and friend, David Toth for sharing a bit about how we first met and began working together. ~ by DanielleVennard on May 4, 2012.